Twelve trotters qualified for the final stage of the Assikura Championship for class Bronze which was held on a short distance of 2,140m. 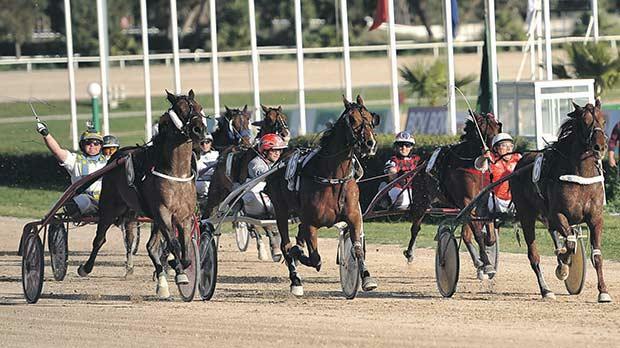 The three semi-finals of this competition were organised yesterday at the Marsa Racetrack and formed part of the tenth meeting of the year, made up of eight races all for trotters. The card included also a class Premier race on a long distance of 3,140m and was won by French outsider Ourasi Diams, under the guidance of Anthony Fenech. Fifteen trotters lined up for the class Premier race. As expected, Italian favourite Overtaker By Sib (Marco Refalo) went in front with a lap to go and tried to open a small lead from Qui Sait (Rodney Gatt) and Rickshow (Charles Camilleri). However around 200m from the end, Overtaker By Sib ran out of steam and was overtaken by Ourasi Diams (Anthony Fenech) which cruised to its first win of the year. Danish Nelson Derm (Anton Pace) was second ahead of Qui Sait and French debutante Radjah De Venel (Salvu Vella). Ourasi Diams clocked an average time of 1.16.1” per kilometre. In the first class Bronze semi-final, a keen tussle between three trotters ensued in the last 200 metres. It was French Quitus Beauregard (Charles Camilleri) which gained its second win in a row by a half length from Nisio MRS (Noel Baldacchino) and Uranium Des Arkads (Kurt Saliba). Quarborandum (Philip Calleja) also progressed after ending in fourth place. Quipson (Rodney Gatt) upped its pace midway through the final straight of the second class Bronze semi-final. This French trotter managed to pass the final post first to place ahead of Quersis (Noel Baldacchino). Lord Indika (Clint Vassallo) and Dreamed Victory (Jason Zahra) followed home in that order. In the third and last class Bronze semi-final, Swedish Janitor (Julian Farrugia) led all the way, but in the final straight this veteran trotter had to go all out in order to hold off the challenge of Voila Dry (Ivan Bilocca). Rayon De Soleil (Mark Mifsud) and Oleggio (Brian Camilleri) were the last two trotters that qualified for the final race of this championship. Another meeting at the Marsa Racetrack will be held next Sunday. The first race should start at 1.30pm.